Counting both the Chevy Silverado and GMC Sierra, General Motors sold more large pickups than Ford overall for a second consecutive month. Ram and Chevrolet push pickup sales as Ford prepares to launch aluminum-bodied 2015 F-150. The U.S. luxury sales race is a 3-brand contest, while Audi leads the chase for 4th. Compact CUVs passed compact cars through 9 months this year. Jeep and Ram are booming, propelling Chrysler Group past Toyota-Lexus-Scion. Falling gasoline prices this year contributed to surging sales of light trucks. *Nameplates with electric or hybrid models only. Chevrolet and Ram are enjoying a golden sales opportunity for full-size pickups. Falling gasoline prices and a growing economy are stoking U.S. demand, while Ford Motor Co. is caught changing over to the aluminum-bodied 2015 F-150. The Ford F series, which includes Super Duty models, stayed in first place in September, despite a 1 percent drop. But counting both the Chevy Silverado and GMC Sierra, General Motors sold more large pickups than Ford overall for a second consecutive month. 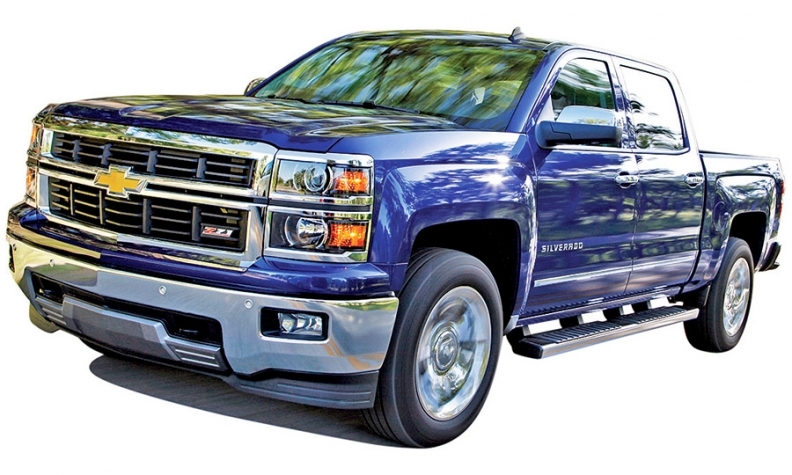 The Silverado, with a 54 percent gain, hit 50,000 units in a month for the first time since 2012. A 30 percent surge for the Ram helped Chrysler Group outsell Toyota Motor Sales U.S.A. for the first time in three years. Pickups "still rule the roost, as they have for decades," said Karl Brauer, senior director of insights at Kelley Blue Book. But with Ford trying to avoid running low on pickups before the aluminum-bodied 2015 F-150 arrives, "they can't get into a sales race with Chrysler and GM right now." Only one of Ford's two F-150 plants is assembling pickups. The other is being refitted to assemble the 2015 model. Gasoline prices, down to about $3 a gallon for regular fuel in some states, are helping bring back buyers who don't need a pickup but like driving one. And the economic recovery has finally persuaded more contractors and business customers to trade up. "We took in a 320,000-mile truck just last week," said Ted Eck, general manager at Chevrolet of Montebello, in a Los Angeles suburb. "That was someone holding onto their work truck as long as they possibly could."